Marine biologists have long thought that blue whales indiscriminately scour the oceans as they feed on krill. A new study shows there’s a lot more to the grazing habits of these massive mammals than just blindly swimming through the water. Blue whales are probably the largest animal that has ever lived on Earth. As filter feeders, blue whales use baleen plates in their mouths. During lunge-feeding, blue whales accelerate and extend their mouths, drawing in a tremendous amount of water — up to 130% of their weight. The strategies that blue whales employ while grazing for krill isn’t very well understood. So to learn more, a group of scientists from the U.S. National Oceanic and Atmospheric Administration, the Marine Mammal Institute, and several other groups, used tags to track the movements of more than 50 blue whales and their prey. [Blue whales] feed more intensely when krill density is high but avoid doing so when there is less krill in order to save oxygen for future dives. 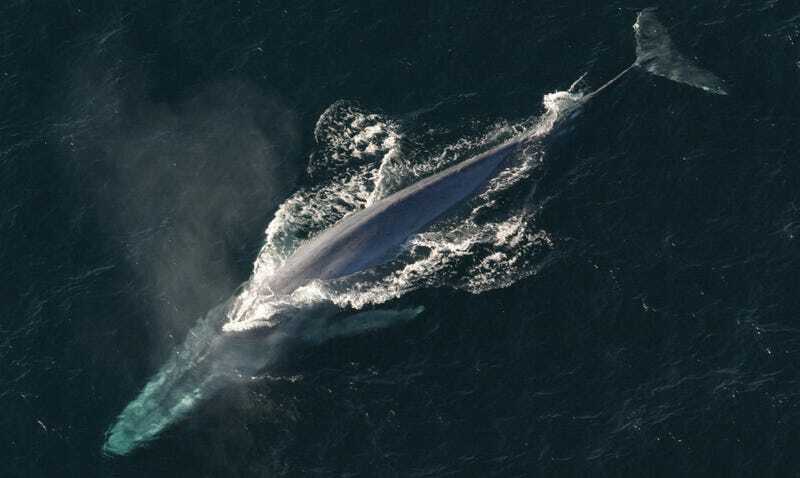 “We found that blue whales have a complex strategy of switching from conserving oxygen when prey quality is low, to intense foraging at the expense of oxygen when prey quality is high,” said research ecologist Elliott Hazen of the U.S. National Oceanic and Atmospheric Administration’s Fisheries Science Center and the University of California Santa Cruz. “The whales are much more actively assessing their environment and taking advantage of prey in ways that were unknown before, to maximize energy gain,” added ecologist Ari Friedlaender of Oregon State University’s Marine Mammal Institute. So when krill are scarce, feeding rates and energy intake are lowered to minimize oxygen use. But when krill are abundant, feeding frequency is increased to maximize energy intake. Makes sense. “Contrary to previous paradigms, we demonstrate that blue whales are not indiscriminate grazers but instead switch foraging strategies in response to variation in prey density and depth to maximize energetic efficiency,” conclude the authors in their study. Read the entire study at Science Advances: “Blue whales (Balaenoptera musculus) optimize foraging efficiency by balancing oxygen use and energy gain as a function of prey density”.